Successfully Added Z28 Android 7.1 TV Box - Rockchip RK3328 CPU, RKMC Media Player, 4K x 2K, USB 3.0, Miracast, Wi-Fi to your Shopping Cart. The Z28 TV box is packing a new Rockchip RK3328 CPU. This new 64-bit processor is yet another great chip is dedicated to the TV box market. With 4 cores running at 1.5GHz and a Mali 450MP2 GPU, it has powerful graphics handling that can manage 4K outputs and boats support for H.264, H.265, HEVC, and VP9 decoding. Rockchip's very own version of the profoundly popular KODI media player, known as RKMC is preinstalled on this smart TV box so you'll have plenty of movies and TV to chose from. All this makes the Z28 TV box a powerful tool for downloading and streaming movies with the preinstalled RKMC media player and other services. With the latest flavor of Android OS on this TV box, you'll be able to enjoy Android Nougat on your TV that brings all the latest bells and whistles for you to benefit from. These include a smarter settings menu as well as a more intelligent Google assistant and smart storage that better manages your memory space. When it comes to storage the Z28 smart TV box has a modest 8GB but with a micro SD card slot you can easily add an extra 64GB and USB drives make it easy to store data on memory pens while the fast Ethernet and wi-fi speeds mean that cloud storage is quickly accessible. 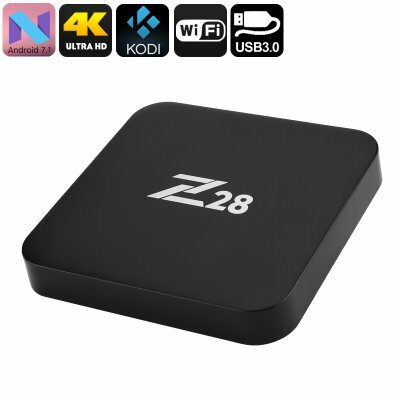 The Z28 TV box product comes with 12 months warranty, brought to you by the leader in electronic devices as well as wholesale smart TV boxes and media gadgets..